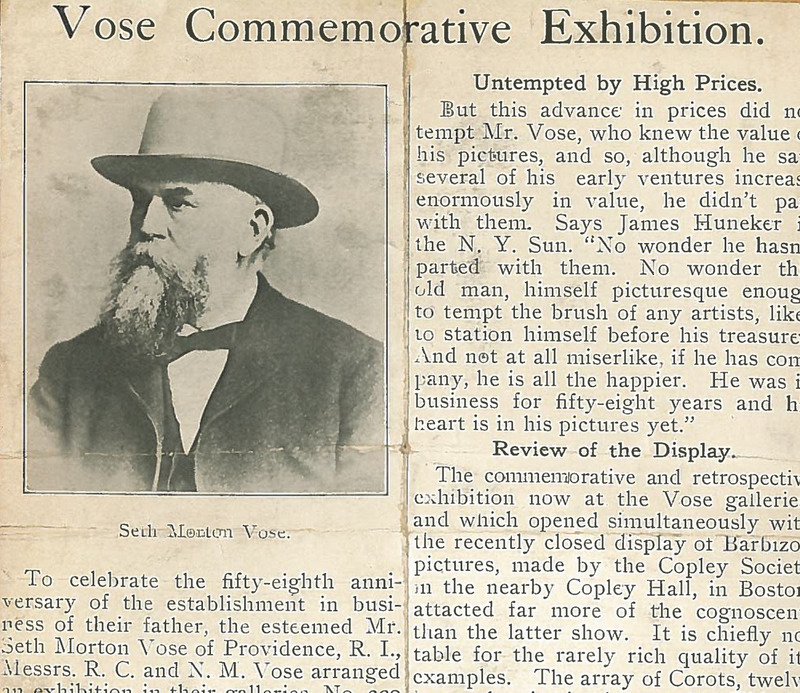 The death of Seth M. Vose in April of 1910 marked a period of great change for Vose Galleries. Robert Vose closed the original Providence storefront and gradually began to distinguish his tastes from those of his father. Although Robert would maintain the tradition established by Seth in the collection and display of Barbizon paintings, a 1909 exhibition at the Alaska Yukon Pacific Exposition in Seattle would signify a transition towards an emphasis on 18th-century English portraiture and 19th century Dutch paintings. Robert also began displaying works by American artists who were lesser known in Boston, including William Anderson Coffin (1855-1925), Edwin Lord Weeks (1849-1903), Mary Macomber (1861-1916), and Charles Gruppe (1860-1940). The 1910s brought some controversy to the success of Robert's travelling exhibitions. In December of 1914, he was displaying a series of Old Master paintings in the Planters Hotel of St. Louis when he was issued an ordinance by the local Retailer's Association. This ordinance, intended to protect local merchants, demanded that Robert pay a tax of $100 for each day that he exhibited his collection. Robert argued that this rule did not apply to his business because he sold one-of-a-kind pieces which were not obtainable anywhere else in the world, and thus was not in competition with St. Louis retailers. At this point, Robert had already been visiting St. Louis with his paintings for almost a decade and had yet to meet any opposition. When hearing the case, Judge Hitchcock pronounced the ordinance "extravagant, prohibitory, and void," and Robert was allowed to return to Boston without a fine. Ironically, the St. Louis Municipal Art Museum purchased Homer Martin's (1836-1897) The Headwaters of the Hudson in the midst of this law suit. 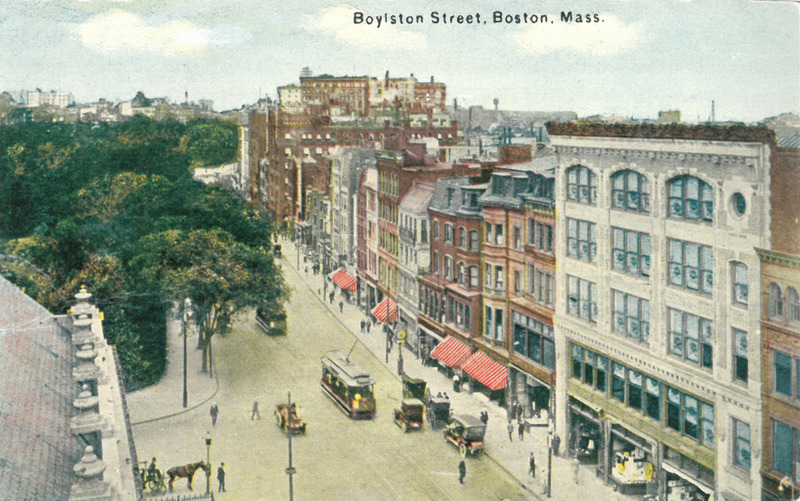 In addition to distributing masterpieces throughout the country, Vose Galleries helped to strengthen collections in Boston during the 1910s. The Gallery assisted Boston's Museum of Fine Arts in expanding their existing collection of English paintings through the acquisition of top-quality works such as Landscape with Blind Man Crossing a Bridge by Thomas Gainsborough (1727-1788). Vose also helped to initiate the Museum's policy of collecting native contemporary artists; the purchase of Charles W. Hawthorne's (1872-1930) The Mother from Vose in 1916 was their first acquisition of an important painting by a living American artist in many years.